Beget Review 2019: Is Beget a Good Hosting? Since their inception in 2007, Beget has become one of the top ten web hosting providers in Russia. They’re known for offering reliable web hosting services at a good price. As one of the top ten web hosting providers in Russia, Beget is no stranger to the industry. They’re not flashy by any means, but since their inception in 2007, they’ve been offering reliable web hosting services at a good price. They’re headquartered in St. Petersburg, Russia, and their website is available in English and Russian. Beget offers a fairly standard range of shared hosting plans, along with dedicated servers and what they call Premium Hosting plans. The latter looks like a VPS or low-load shared server option – essentially, the Premium Hosting servers can handle a load that’s seven times greater than what their typical shared hosting plans can take. Where Beget really stands out is in the resource allocations they offer to their users. All shared and premium hosting plans come with unlimited MySQL databases, unlimited emails, unlimited subdomains, and unlimited bandwidth – the main limitation is in the storage space and the number of websites you can host. Of course, when they say “unlimited bandwidth,” it isn’t truly unlimited – they’ll cap your account at 65 CP a day, which in layman terms simply equates to about 7100 visitors a day for a basic WordPress website. When you consider that this limitation applies even to their Noble and Great plans – which allow up to ten and 25 websites respectively – this actually isn’t a whole lot. This means that while their shared hosting plans are great for smaller websites, you’ll have to opt for something heavier-duty if you’re expecting a ton of traffic. Beget has a 99.9% uptime guarantee for their shared servers, though this isn’t readily advertised on their website for some reason (you’ll have to dig through their “Terms of Service” to find it). Beget doesn’t offer cPanel with their shared hosting plans, but for the most part, their interface was surprisingly simple and easy to navigate, albeit lacking the robust functionality that cPanel offers. Once you’ve selected a plan, you’ll be asked for your contact details and credit card information. After that, your account is set up and presented to you in just a few seconds – they even provide you with a Beget subdomain based on your username, just in case you haven’t purchased a domain yet. One thing I was slightly disappointed by is that certain aspects of their interface haven’t been fully translated into English, but that was easily resolved with the help of Google Chrome’s Translate to English feature. Beget’s prices aren’t the lowest on the market, but they’re definitely one of the most affordable choices – which explains why they’ve grown to become one of the top ten largest hosting providers in Russia. This is especially pertinent when you consider the number of unlimited features they include in each package. They don’t have a free plan available, but they do give you an evaluation period of 35 days for you to test their service risk-free. You can make payment for the package at any time within the 35 days; the remaining evaluation period will simply be added on to the duration of your hosting plan. Also, if you pay for your annual contract in one lump sum up front, you’ll enjoy a discount. Changing plans is easy enough with Beget: all you have to do is click on the new plan name directly in your web hosting control panel, then press the button Change tariff plan. You can also add or remove features from your package (provided you don’t fall below the base configuration of the plan). 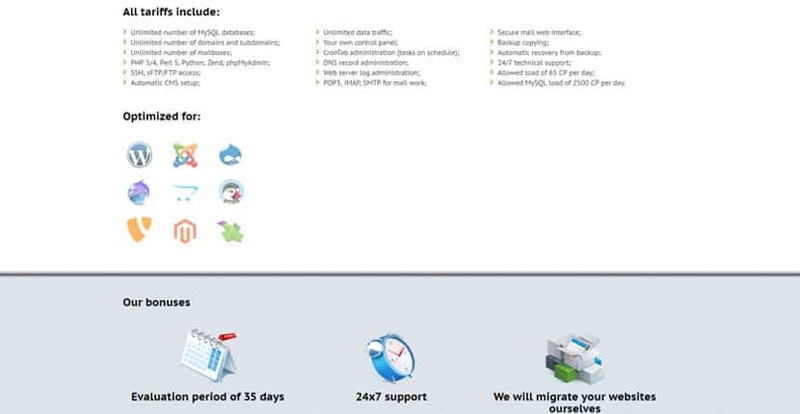 They include a free website migration service, so you can easily transfer over from another hosting provider without much downtime. Beget also has a decent manual that covers the basics of their user interface. There’s no search function and it won’t help you troubleshoot any account issues, unfortunately, so if you want more specific assistance, you’ll have to contact their customer support team. Their support staff is available 24/7 via email or the ticketing system in your user admin panel. Sadly, there’s no phone or live chat support, but given that their help documentation all tend to be in Russian, I’m not holding high hopes even if they do provide those in future. onClick="trackClickout('event', 'clickout', 'Vendor Page - Visit User Reviews', 'Beget', this, true);"
Beget.ru doesn't care about copyright infringement issues. If you send them an email with a legitimate claim announcing that their clients infringed your copyright, they do not make the slightest effort to help you. They protect their clients even though they have stolen content on their websites and even though you are proving the proofs that you are the copyright holder and that your content was uploaded without consent. I've only asked to inform their clients that there is a copyright infringement issue, but they are asking me documents unrelated with my issue and they are hiding behind the Russian law. The funny (except the fact they reply in Russian, not in English like I do) is that I've wrote them 6 month ago and they didn't asked me any documents at all. Now they have a rude attitude with no reason. Beget offers some solid, budget-friendly shared hosting plans for those just starting out in the web hosting scene. However, their CPU usage caps on their basic plans won’t be enough for traffic-heavy websites. Wondering how Beget stacks up against other Web Hosting companies? Enter any other Web Hosting company and we will give you a side-by-side comparison.